The Animal Welfare Association is formed (Kelly’s Directory 1926). Their address is 9 Commercial Street,Cheltenham. Mrs J L Gordon (Hon Treasurer) and Miss Inge (Hon Secretary). The Animal Welfare Association is listed under E W Craddock, Animal Shelter (Kelly’s Directory 1927). Their new address is Roselands, Leckhampton Road. The Superintendent is Mr W A Rodgers. This remains in the Kelly’s Directory until 1930. The Shelter remains at this address until 1940. 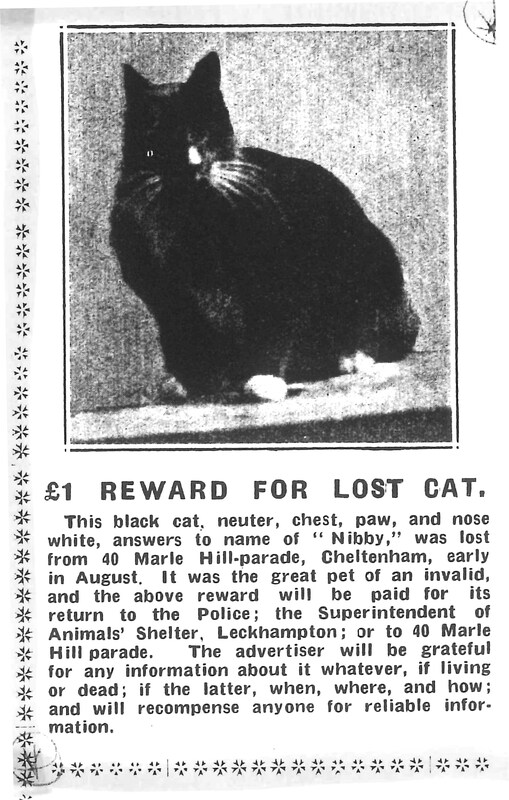 Saturday 8th September, reward poster published in The Cheltenham Chronicle. E W Craddock, Animal Shelter now retakes the name ‘The Animal Welfare Association’ (Kelly’s Directory 1930). Mrs J L Gordon is now Chairman of the Animal Welfare Association. In March, The Animal Welfare Association holds its annual business meeting at Roden House, Pittville. 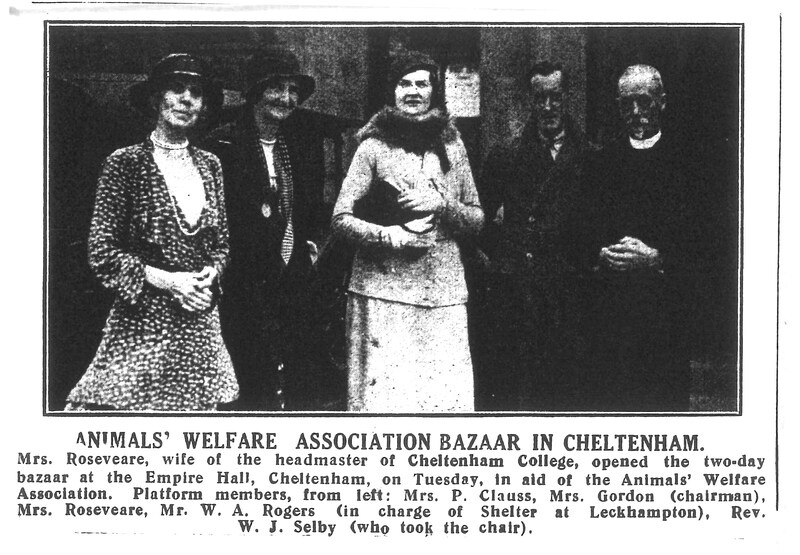 The Cheltenham Chronicle, 19th October ‘Cheltenham Bazaar For Maintenance of Animals Welfare Shelter’ . 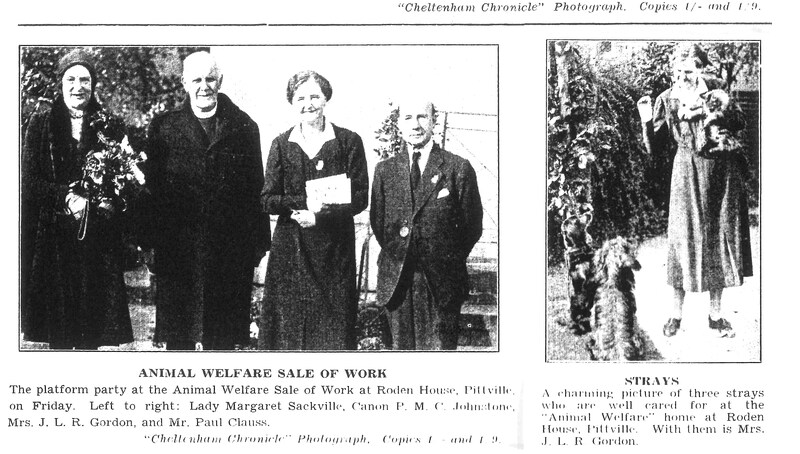 Saturday 11th November, picture of the Animal Welfare sale published in the Cheltenham Chronicle. The Animal Welfare Association moves to Gardners Lane (Kelly’s Directory 1940). Mrs J L Gordon of Roden House, Pittville is still the Chairman. Saturday 2nd November, The Cheltenham Chronicles features article about the annual bazaar. Do you have any archive images or stories of the ‘Early Days’ ?